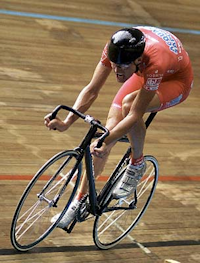 On september 9th 2000, the UCI decided to create a “UCI Hour Record” as well as a “Best Hour Performance”. Look here for the news document. From that day, the UCI Hour Record is the one that Eddy Merckx achieved in Mexico on 25th October 1972, covering a distance of 49.43195 km. This UCI Hour Record can only be attempted if the equipment is presented and checked beforehand by the UCI and it must be similar to that used by Merckx. Obree had to cancel the attempt as the bike he’d built himself was not suitable for the conditions. In an interview in “Cycling Plus 224”, 43-year-old Obree says he has been training hard, built a bike that conforms with UCI regulations, and set a date of late 2009 to make the attempt. Ondrej Sosenka breaks hour record! Czech rider Ondrej Sosenka (Acqua e Sapone) will undertake a hour record attempt in Moscow on 19th july. Swiss track specialist Jean Nuttli tried to crack the track hour record on Wednesday, December 15, but failed. In the Vienna Velodrome, Nuttli only completed 46.642 km. He said that his training results had been OK, but the dry air in the velodrome made it hard to breathe. MANCHESTER, England – Michael Hutchinson failed on Wednesday in his bid to improve the world hour record set by former Olympic track champion Chris Boardman three years ago. Hutchinson, 29, who represented Northern Ireland at last year’s Commonwealth Games, abandoned his attempt at Manchester Velodrome after gradually slipping back on his schedule. Boardman was 18 seconds down on Boardman’s mark after the first 10 kilometres and the national road time trial champion slipped more than a minute off Boardman’s pace after 30 kilometres before pulling off the track after 40 minutes having covered 32.5km. Swiss champion Jean Nuttli abandons his first attempt after 60 laps (15 km/48.449 km/h). It seems that he has problems to keep his nerves under control. A 20 minutes training ride in normal cycling clothes was faster than the actual attempt. On the next day he completes one hour, but reaches only 47.093 km. German cyclist Thomas Liese has failed in his attempt to break the one-hour cycling record. Liese stopped his attempt after 37 minutes because he had fallen behind Boardman’s pace (about 600 m). Liese rides for the team Nuernberger and was returning to professional cycling after a 12-year break. Ten days after the end of the Giro D Italia Abram Olano cancels his attempt.